Hard strength and resilience are needed to survive each new day in the treacherous world of postnuclear America. For Ryan Cawdor and his companions, honor, integrity and a willingness to kill are necessary as well, as they struggle to balance a survivalist spirit with a warrior's resolve to press on, living by their own rules in a tortured land, pursuing a dream that leads them into the unknown . . .
Ryan and his group make their way to a remote island in hopes of finding brief sanctuary. Instead, they are captured by an isolated tribe of descendants of African slaves from pre-Civil War days. When the tribesmen declare Mildred Wyeth "free" from her white masters, it is a twist of fate that ultimately leads the battle-hardened medic to question where her true loyalties lie. Will she side with Ryan, J.B. Dix and those with whom she has forged a bond of trust and friendship . . .or with the people of her own blood? But the loss of Mildred is not the only threat the group faces -- in a treacherous world where the ties that bind can cut both ways. 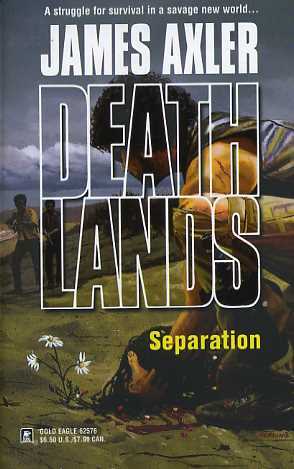 In the Deathlands, the future is not what it used to be . . .